EL MONTE – Sebastian Reyes is proud to be a freshman – both in high school and in college. As a member of the inaugural class of the Early College Academy at South El Monte High School, Reyes will concurrently take high school classes and college courses taught by Rio Hondo College professors – setting the foundation for pursuing a career as a computer programmer. The Early College Academy – the result of a partnership between the El Monte Union High School District and Rio Hondo College – enables South El Monte High students to earn a high school diploma and up to two years of college credit in four years, or 40 credits, which are transferable to UCs or CSUs. Students can take college-level general education courses for free at SEMHS or at the Rio Hondo College campus, reducing the cost of attaining a college degree. During the visit, students received a Rio Hondo ID card, spoke to a representative from the Learning Resource Center, participated in a time management workshop, toured Rio Hondo’s Tesla START training facility, met with an instructor from the Architecture, Civil Engineering, Design, Drafting CAD and GIS school, and lunched at the Rio Café. Early College Academy students will earn three units per semester as freshmen. As part of a daily schedule that includes Honors English, Honors Biology, integrated mathematics and AVID, students will take two classes taught by Rio Hondo instructors: Counseling 101, taken in the fall term, teaches students how to navigate the college system; and Library 101, taken in the spring, introduces students to the print and online resources available to Rio Hondo students. The Early College Academy four-year program escalates the college experience with each school year. Students will be required to take a summer school class for college credit and, beginning in their junior year, take two Rio Hondo classes per semester. Rio Hondo will provide counseling, advisement and matriculation, while El Monte Union will cover the cost of textbooks and materials. The program may expand to other El Monte Union schools should it prove successful. 091718_EMUHSD_RIOVISIT1: South El Monte High School freshmen – members of the inaugural class of the Early College Academy – prepare to take a tour of Rio Hondo College on Sept. 7. Students will concurrently take high school classes and college courses taught by Rio Hondo professors, and graduate in four years with a high school diploma and up to 40 college credits, which are transferable to UC or CSU colleges. 091718_EMUHSD_RIOVISIT2: South El Monte High School freshmen enrolled in the Early College Academy listen as a Rio Hondo College counselor details the services available through Rio Hondo’s Learning Resource Center on Sept. 7. For many of the 120 students who make up the ECA inaugural class, this was their first time on a college campus. Students took a campus tour, met professors, talked to Rio Hondo students and visited classrooms. 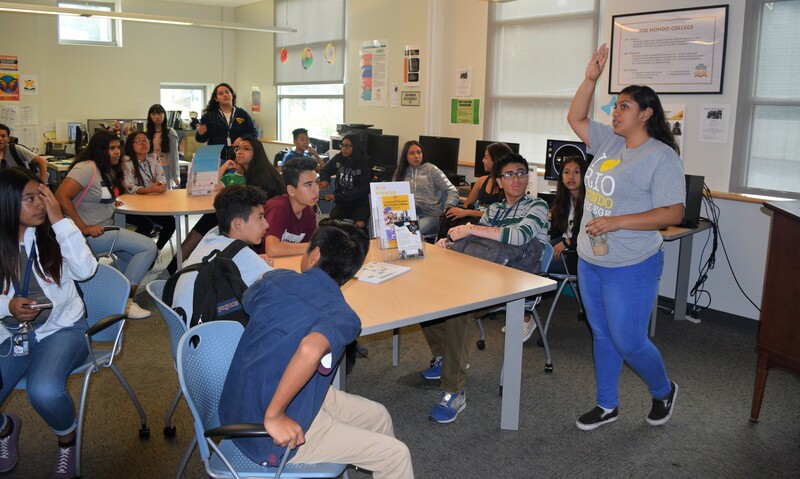 South El Monte High School freshmen enrolled in the Early College Academy listen as a Rio Hondo College counselor details the services available through Rio Hondo’s Learning Resource Center on Sept. 7. For many of the 120 students who make up the ECA inaugural class, this was their first time on a college campus. Students took a campus tour, met professors, talked to Rio Hondo students and visited classrooms. 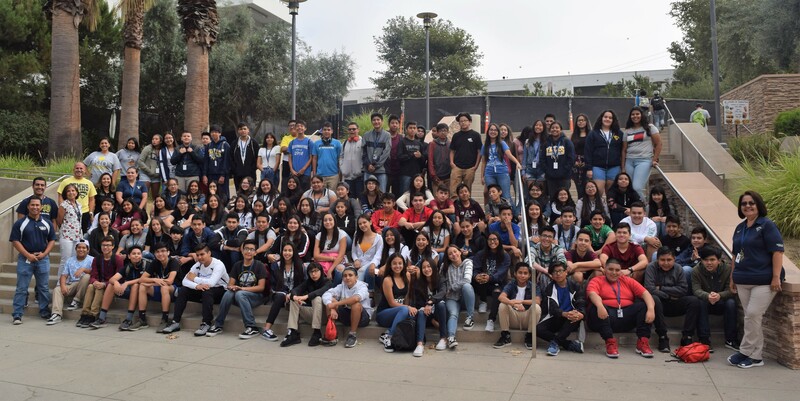 South El Monte High School freshmen – members of the inaugural class of the Early College Academy – prepare to take a tour of Rio Hondo College on Sept. 7. Students will concurrently take high school classes and college courses taught by Rio Hondo professors, and graduate in four years with a high school diploma and up to 40 college credits, which are transferable to UC or CSU colleges.